Some of the photos below may be considered graphic. 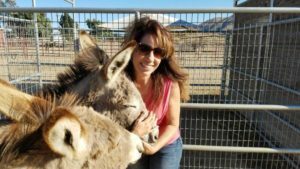 There is a rescue in Moreno Valley, California, unique in that it specializes in care for the wild burros native to the area. 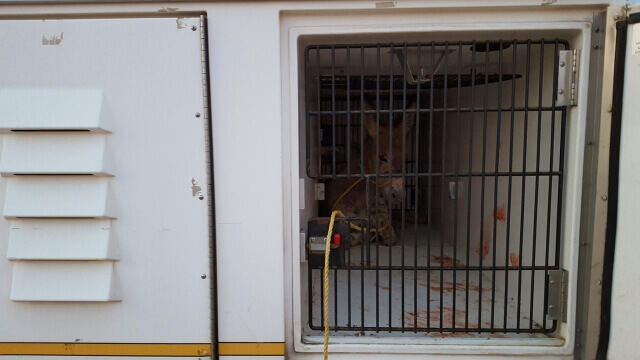 Originally a two-person, father-daughter operation on rented land, the rescue had no indoor areas and could only take in a few animals at a time. With limited resources they persevered, and their hard work was noticed by Bob Barker’s DJ&T foundation, which granted $400,000 to the tiny team. The money was used to purchase over two dozen acres, allowing them take in more animals and find some help. 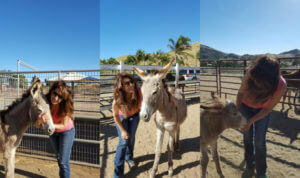 They named their bigger, improved location Donkeyland – a perfect name for a haven for rescued burros! 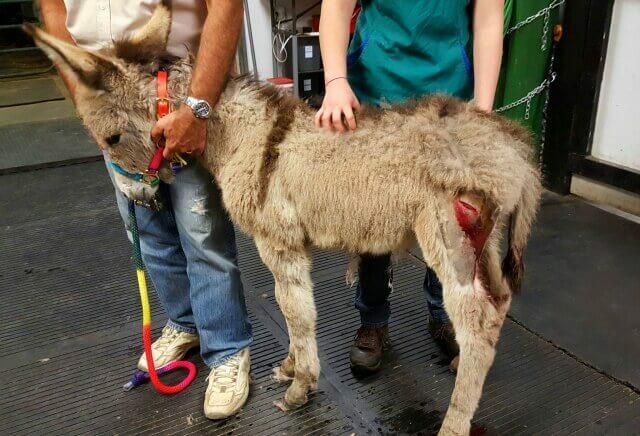 One of the first residents at Donkeyland was a young, wild burro was found by a group of children with deep wounds on his backside and belly, the victim of an apparent dog attack. It’s believed that he was abandoned as the rest of the herd – including his mother – fled for their lives, leaving him alone, frightened, and severely hurt. Very small at only a few months old, he was taken by Animal Services to a local veterinarian in a mobile compartment usually meant for dogs. He cried out for his mother, but she and the rest of the herd were gone. The young burro was named DJ, after the DJ&T Foundation which had recently made his rescue, and the rescue of several other burros, possible. He was looked over by a local veterinarian, Dr. Wan, cleaned up and put in a pen with other young burros. However, DJ didn’t adapt to his new home right away. He spent a lot of time crying for his mother and was bullying other animals. Eventually he had to be placed in an enclosure of his own to keep him from hurting the other residents at Donkeyland. The volunteers had to handle him frequently to keep his wounds clean and care for him, and eventually, with love and kindness, they were able to win DJ’s trust. A heartbroken horse, and owner. Helma Bernadini, a local woman with a love of animals found herself with a problem. She had just lost a horse to cancer, and her other horse, Gunner, was not coping well. Lonely without a friend, he was gripped by a “horrific grief” as Helma describes, and had fallen into a deep depression. Although she knew it’d be easy to just buy another horse, Helma is a firm believer in adoption. She tells iHeartAnimals, “There are too many people purchasing animals at premium prices, which only supports animal breeding. Meanwhile, animals are being euthanized by the millions in the United States alone. I believe that people only need an open mind and an open heart and they can give a homeless, neglected or abused animal a second chance in life and that these animals will reciprocate the favor in love and loyalty infinitely. The best pets are adopted pets; there is something about the gratitude given from an animal coming from dire circumstances.” Who wouldn’t agree? Helma knew about Donkeyland from acquaintances of hers who work as volunteers at the rescue, Susan and Gene. They were on site when DJ was found, and through them, she’d heard about the little burro who learned to trust after being orphaned. Usually, an orphaned burro as young as DJ wouldn’t be considered a good candidate for adoption – but Helma claims they chose each other. As a failsafe, Donkeyland retains ownership of their burros, so that they can’t be sold and will be rehomed if, for some reason, the adopter can’t keep them. Because DJ took to her, and she was already experienced and had another equine who needed a friend, she was allowed to take him home. DJ’s new home and happy family. “DJ is now part of my family,” Helma says. 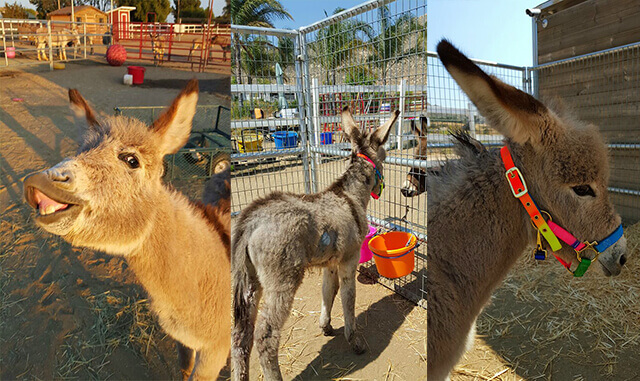 For a wild little burro, alone and lashing out at a world that frightened him, he’s come a long way – and his story is only just beginning.